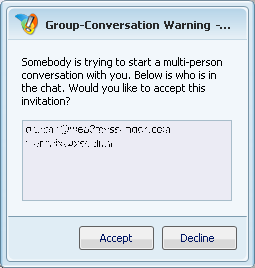 Windows Live Messenger allows you to have group conversation by simply inviting your friends to your current chat window. Have you ever noticed that group chat is really annoying because you are automatically being pulled in when someone invites you? - Does nothing but close the little warning window, so you can have the group chat like normal. - Tells the conversation "Please ask before starting group conversations". This script does not actually avoid being invited into group chats, but it does make it easier to leave them. In order to use this script you need to install Messenger Plus! Live plugin.